Heres the good scan of my first Kilik attempt. This was requested by Sea Wolf on the SC2 forums.....here ya go buddy, hope you like it. Good Pic. 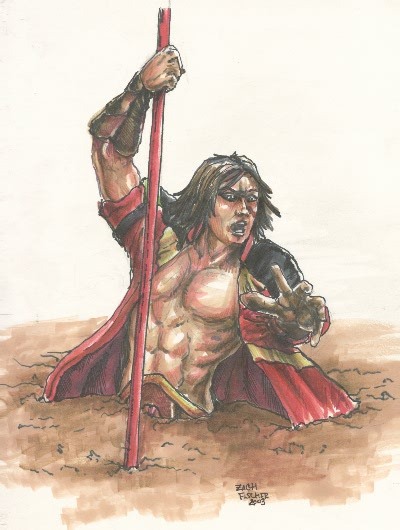 BUT HOW DARE YOU PUT KILIK IN QUICKSAND!! He is so freakin' hot! Why did you do that?! ~starts pulling Kilik out~ Don't worry my love! You'll live! why are you so good? I must fav you now, *favs* *sigh* another one to put on my drawing... oh well I'm glad of it n_n you are really talented!!! Just in general, what in the world is the deal with Kilik being in quicksand? There's an awful lot of art of just that.